Hello Darlings, Dozens of outfits found their way to my bed and favourite sandals scattered themselves all over the bedroom floor. Although it was about 1:30AM, I was just then pulling out my suitcase to pack for a 6AM Toronto to Cancun Interjet flight that day. With Lauper’s “Girls Just Wanna Have Fun” blaring from my Beats Pill and a glass of Amarone in hand, I was a in blissful state knowing that just few hours from now I’ll be on a beach. It wasn’t so much the beach that induced the type of excitement that I also experienced the first time packing for my reading week getaway, but the occasion - not one, but two! It was my annual birthday sun pilgrimage and I was ready to bid farewell to my 20s by welcoming my 29th birthday. More importantly, it was the last time I’d spend with my best friend while she was still a single woman as she was soon to be off on the journey of married life. Between dress fittings and seating charts, we decided to honour the many trips and adventures we had together with one more. A week spent doing what we do best - lounging on the beach, drinking champagne, eating tacos, shopping, dining and sipping fine wine. While most trips make memories, this time the memories defined the trip! We were about to resume my affair with Mexico as last year’s trip reignited my love for the country. Last birthday getaway was to W Punta de Mita in Nayarit, this year we returned to the opposite coast. Stretching from Cancun all along the Yucatan Caribbean coast, Riviera Maya is one of Mexico’s most visited destinations. 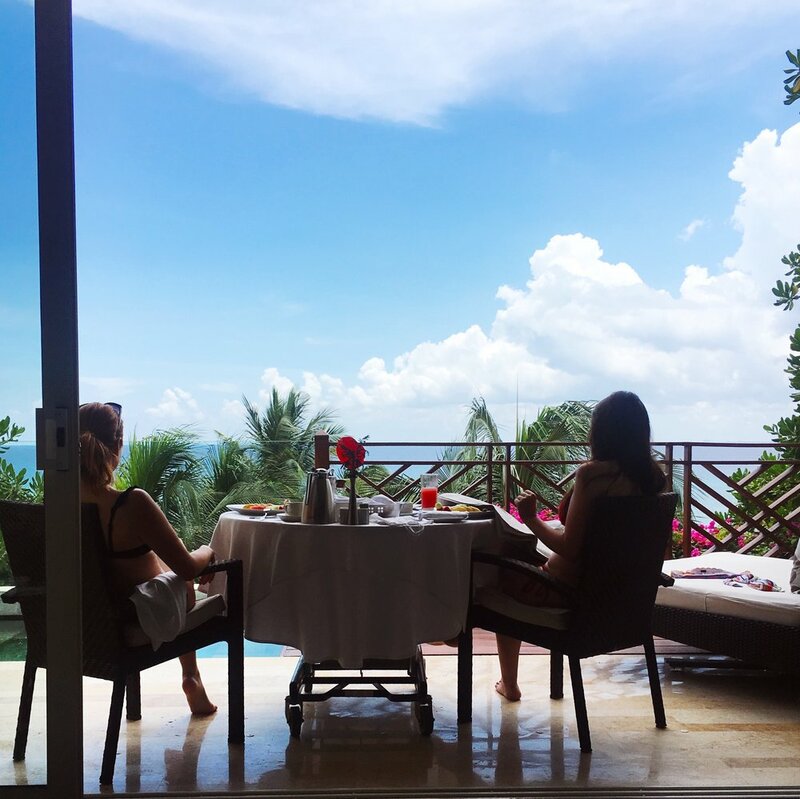 While Cancun is known for its wild parties and shopping extravaganzas and Tulum is the mecca of well-being; we chose the happy in-between, Playa del Carmen. Ashley and I are particular in our likes to say the least (if you were to sum us up as a duo). With this trip, all of our expectations were surpassed many times over. Our stay at the luxurious Grand Velas Riviera Maya definitely left us feeling spoiled beyond words and belief. Surrounded by a vast forest of mangroves on the edge of the Caribbean Sea, the stunning property sits on 80 acres that is mostly filled with lush jungle and cenotes. Entering through the colossal gates of Grand Velas is as if being transported into a different world. All that welcomes you is nature for the 10 minutes as you drive up to the main Ambassador lobby. The resort is divided into three distinct spaces; Zen Grand Natural View, Ambassador Family Friendly and Grand Class Adults Only. Zen Grand is surrounded by the Mayan jungle with a palapa-covered bridge system to get you around and is a slice of jungle paradise. The next is an Ambassador section which is made for beach lovers with infinity pools and the views of 1,600 feet of pristine white beach. Lastly, the ultra-luxe Grand Class is an adults only playground is for complete relaxation, with extra-large suites, private plunge pools and a spa-style bathroom. It has everything to your heart's desire and was our home for the stay! Mexico has countless all inclusive resorts but only three in the nation have earned the highest possible AAA 5 - Diamond rating, and two of these are the sister Grand Velas properties in the East and West coast. For an all inclusive experience, it creates a new standard of excellence. I will be the first to admit that I am not a fan of all-inclusive travel as in my experience the quality of service and cuisine is greatly compromised. To say that Grand Velas is a luxury escape would be an understatement. They delivered luxury in a way that some of the world’s most renowned names in hospitality could not, at least in my experience. Aside from the pristine grounds and modern design, every aspect of the property is designed with a visitor in mind. From children and teenage clubs, to a state of the art gym and remarkable spas, all of the services offered are done so with utmost care. In Grand Class, every suite has excess to a personal concierge. Edgar was on hand to fulfill every whim while making sure that our room was stocked with our favourite treats and beverages. During the stay he overlooked every detail. From itinerary planning, transportation, suggestions to you name it - Edgar was there (shoutout to Edgar). With eight gourmet restaurants, it offered a culinary tour through Mexico, Europe and Asia. The restaurant’s offerings were recognized by Forbes’ Top Ten List while Piaf and Frida were awarded AAA 4-Diamond rating for their deluxe cuisine. The resort also only carries premium spirits and world renowned wines. Although the resort gave us very little reason to leave, we still ventured out to spend most of our evenings in Playa del Carmen. While some women may get nervous exploring Mexico outside of the compound of their hotel, Ashley and I took every advantage to hop into a cab to find adventure. Yes, we did take local cabs and felt confident doing so with only the most friendly service. In Playa del Carmen we enjoyed many restaurants including my New York favourite, Catch, where I hosted my birthday dinner. We also loved La No. 20 Cantina for both their environment, food and live music. Their live performance following dinner is perfection while sipping on champagne. We liked it so much that we ventured back three whole times. As for clubs we did stop by a few, but it was not really our favourite environment. A month after we got home, Ashley was struggling to hide a bikini outline from under her wedding dress. Meanwhile, I was preparing for my maid of honour duties. Following the wedding, Ashley and her husband decided to book their honeymoon at the newly opened Grand Velas Cabo and had an experience equally as wonderful. We now joke that our trip was to scout honeymoon locations - what else are friends for if not that?